redONE to offer its customers a free annual subscription to The Star’s ePaper when they sign up to a Huawei phone bundle subscription. Through this collaboration, any customer who signs up for a redONE phone bundle program with at least 3GB of data a month, will automatically qualify for a free annual subscription to The Star’s ePaper. Users will be able to download an exact replica of the daily print version to their device via The Star’s mobile app, which is available on Google’s Play Store and Apple’s App Store. Farid Yunus, Chief Executive Officer of redONE was there to officiate the launch. “We are very excited to be working with The Star on this project. As the leading English daily and ePaper market leader in Malaysia, we are proud to be their partner” he remarked. “At redONE, we try to go completely paperless in all aspect of our business, so we are pleased to extend this eco-friendly philosophy to our subscribers as well. Bundled together with our lowest postpaid plans and attractive Huawei devices, we are giving all Malaysians the convenience of having your paper in your palm, whenever and wherever its needed.” he added. A yearly subscription to The Star’s ePaper usually costs RM180. 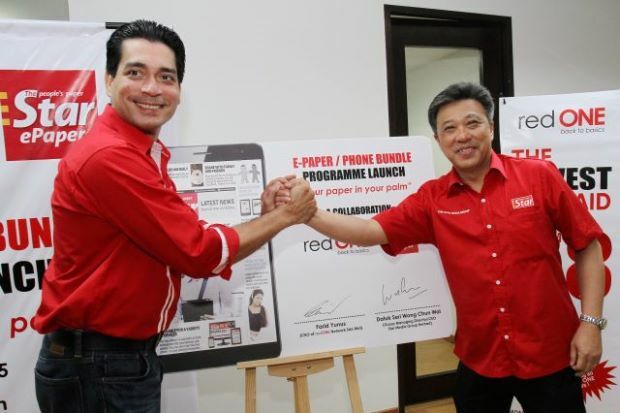 Through this collaboration, however, redONE users will be able to download the daily ePaper, get a new Huawei smartphone or tablet, unlimited free on-net calls and 3GB of data every month, for a monthly usage commitment of only RM88 a month. This collaboration is the first between redONE and an English daily news publisher, and the mobile provider will shortly announce similar bundling programs with other Malay and Chinese language media. The eventual goal is to provide a comprehensive choice for consumers, in whatever language they prefer to read their daily news. redONE provides postpaid mobile services as a Mobile Virtual Network Operator (MVNO) using Celcom Axiata’s infrastructure in Malaysia. Reborn in 2012 with new management and a new brand, redONE’s philosophy and all its services are designed around delivering what customers truly need, in the most simple and practical manner possible. Winner of the Frost & Sullivan MVNO of the Year Award for 2014 and 2015, redONE is growing rapidly and is on track to achieve 1 million subscribers in 2015. For more information, visit www.redone.com.my or www.facebook/RED1Mobile.